optional: spices such as star anise, vanilla, or ginger. I have found 5 star anises, 1 vanilla bean, or a 1″ piece of unpeeled ginger thinly sliced work well. Wash 4 lbs of quince to remove the fuzz. Cut them into one-inch pieces and toss into a big pot with some water in it to keep them from browning while you cut up all the quince. You don’t have to core or remove the seeds, unless you are saving the seeds to make quince tea (in which case, set the seeds aside to dry). After you’ve cut up all the quince and they’re in the pot, make sure the water is just covering them. Add any spices you’re using. Bring the quince-water up to a boil and then simmer it for 45 minutes, stirring occasionally to prevent sticking. Remove the spices and mash the quince, then let simmer for another 5 minutes. Measure the amount of juice you have. As a general rule, you’ll use 3/4 c of sugar or honey to 1 cup of quince juice. You should have approximately 4 cups. In your preserving pot (it’s best to use a white enamel or copper-bottomed pot to prevent scorching), combine the quince juice, the sweetener, and if you’re using sugar, the lemon juice. Stir to dissolve everything and bring up to 222F, which is the gel point, stirring occasionally and removing foam (there will be a ton of it if you use honey). This will take a while, but will allow you witness one of the most beautiful colors in the natural world. In the meantime, sterilize your jars and lids. Do this by boiling the jars for 15 minutes and putting the lids in for the last five minutes of that. Then just keep them all warm until you’re ready to spoon in the jelly. 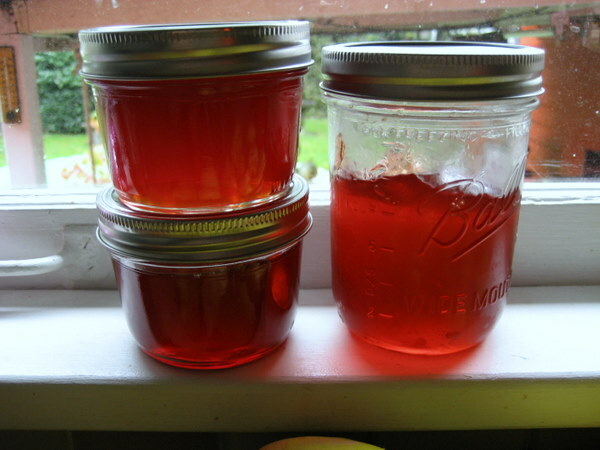 When your jelly reaches 222F, use a clean ladle to pour into the sterilized jars, keeping 1/4″ head space. Put the lids on and screw on the bands (the bands don’t need to be sterilized). Technically speaking, you don’t need to further process this jelly as you would a jam, fruit butter, or preserves. However, if it makes you feel better, you can process the jars in a boiling water bath for 5 minutes. The two on the left are the quince-honey and are a little darker than the quince-sugar version on the right.